I and my volunteer advisor team have been working incredibly hard on putting together an awesome SMX Israel on January 26th in Jerusalem. The agenda is complete and the speakers are 95% finalized. I have personally drafted my presentations for the presentations I am giving, including a morning keynote and then a normal panel in the afternoon. John Mueller, from Google, will be speaking on several panels on the webmaster/organic side. We have Daniel Waisberg from Google UK talking about Universal Analytics. We have Eitan Reisel from Google Tel Aviv talking on YouTube ads. Plus we have a ton of awesome speakers lined up, with some new and interesting sessions. Like I said, I drafted my presentations yesterday and I have never been this excited to talk about the topics. My keynote, named Most Significant Changes In Search Marketing & Where We Are Headed, I have almost 50 slides in 30 minutes. I will be smashing through the most significant changes on the organic and paid side of search in 2014 and then giving you some future thoughts on what you, as a webmaster, marketer, etc need to worry about in 2014. If you want to catch up on everything in 30 minutes - this is your chance. The point of this is to set the stage for the awesome presentations and tips the other speakers will be presenting - I will cover an overview of it all, to wet the audience's appetite. 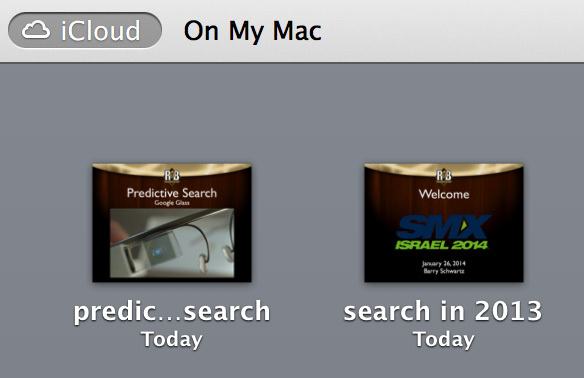 My presentation on Predictive Search, I think, it the future of search down the line. We will have three speakers, Gil Reich on Google Now, Ari Nahmani on Apple Siri and myself on Google Glass. The platform of how predictive search is presented is one piece of this panel, i.e. how Google Now, Apple Siri and Google Glass shows you the search results even before you search. The key, in my opinion, is to demonstrate how publishers, marketers and webmasters can think about getting their content ready for being shown in predictive search in these platforms. Reactionary search - that is easy. Heck, contextual search is also easy. Let's go beyond and think about predictive search. Here is a teaser to get you to sign up for SMX Israel. Really, if you are anywhere in the region, it will be well worth the trip.